100% pure, wild salmon. Absolutely no additives or fillers. This is prime salmon meat from along the backbones. Our salmon burger makes an elegant wild salmon spread or paté. Splendid in salad, pasta or stuffed bell peppers. A wholesome alternative to beef burgers. 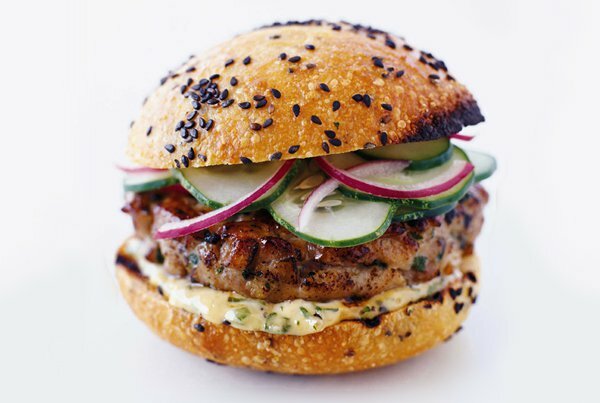 Keep some burger on hand for quick, super-healthful meals. Rich in omega-3s and vitamin D; gluten free. Salmon burger is loose meat; not pre-formed patties.Packed in 1 lb. packages. Fresh flash frozen, 1 lb. bag. Returns June 2019. SIGN UP for a Back-In-Stock Alert! "Seriously amazing, perfect with the cilantro mayo." In a medium mixing bowl, combine the diced bell pepper, panko, garlic and salmon. In a small bowl combine the egg white, soy sauce, lemon juice and salt. Add the liquid mixture to the bowl with the salmon and toss gently until well incorporated. Form the mixture into four equal patties. To make the cilantro may, combine all the ingredients in the bowl of a food processor. Process until well combined and smooth. Lightly coat a grill pan or skillet with 1 tablespoon of the oil. Heat over medium-high heat until hot. Cook the patties about 5 minutes per side, until cooked through.